The Bath Massage Company provide massage services in Bristol. 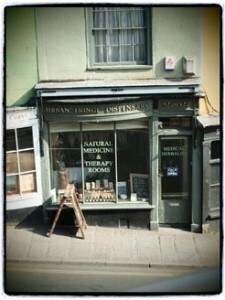 Massage treatments in Bristol are provided at The Urban Fringe Dispensary. This traditional herbal apothecary and clinic is located at the top of the Christmas Steps, in the heart of Bristol, and has a wonderfully tranquil treatment space. Trenchard Street car park is a 5 minute walk from the venue and there is on-street metered parking. Massage treatments are available from here every Friday, including pregnancy massage, deep tissue and Swedish massage treatments. We tailor each massage treatment especially for you and your needs; whether you have specific ailments, problems areas or just want to unwind and relax. During your massage treatment, Polly will use AMK Skin Organics and Decléor massage oils and balms. All these products are 100% pure base oils and contain small amounts of natural essential oils of a high quality with a lightly scented aroma. Pregnancy products: AMK Skin Organics products are 100% safe and effective to use during pregnancy and have been designed to help maintain skin suppleness, prevent stretch-marks and ease muscular aches & pains, bringing tranquility to your treatment.